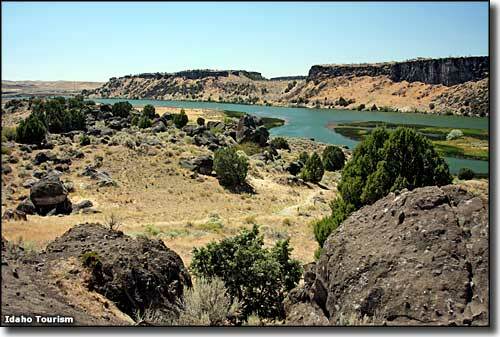 Massacre Rocks State Park is the site of an old campground used often by travelers on the Oregon Trail. This is a 1,000-acre site along the Snake River that now offers 40 campsites with water and power, 4 sleeping cabins, a visitor center, restrooms, hot showers, more than 7 miles of hiking trails, a self-guided interpretive nature trail and a boat launch area. 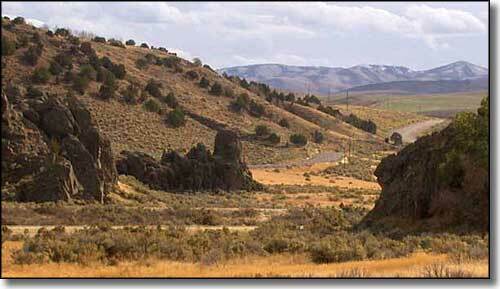 The Massacre Rocks themselves are the remnants of an ancient volcano. The surface of the area was very strongly influenced by the prehistoric Bonneville Flood, an event rated as the 2nd largest flood in the geological history of the Earth. Lake Bonneville covered much of Utah back in Ice Age days and the flood was caused when the lake's waters finally broke through Red Rock Pass and almost completely drained Lake Bonneville in just a few months. During this period, the water flow along the Snake River was probably 4 times the present-day flow of the Amazon River. Massacre Rocks was also known as "Gate of Death" and "Devil's Gate" because of the travelers' fears of being ambushed and killed by local Native Americans. Over the years, several serious Indian attacks did occur in the area. Nearby is Register Rock, a site where Oregon Trail emigrants left their signatures on the rock face before continuing their journeys. Register Rock itself is now covered with a protective shelter and the site offers picnic tables, barbecue grills, fire pits, restrooms, horseshoe pits and shade trees in a grassy setting. Upper photo of Massacre Rocks State Park courtesy of Matthew Trump, CCA ShareAlike 3.0 License. Lower photo courtesy of the Idaho Department of Tourism.